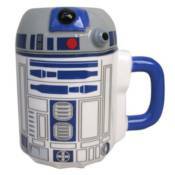 Star Wars R2-D2 20 oz. Ceramic Sculpted Mug:R2-D2 is now an awesome coffee mug! This mug is custom sculpted and beautifully crafted to make it a unique collectible. Holds up to 20 ounces of liquid. Hand wash only. Not dishwasher safe. Do not microwave. Measures approximately 5 1/4-inches tall by 5 1/2-inches wide. Ages 13 and up.